Mr Haroon had a lifelong interest in Music, History and Religion. Since 1955 Mr. Haroon performed and recorded as a Jazz Trombonist and African and Middle Eastern percussionist. He had strong cultural links with both traditional world music and The Avante Garde. He is listed in the International Who’s Who in Music & Music Directory (8th Edition) Cambridge, England. 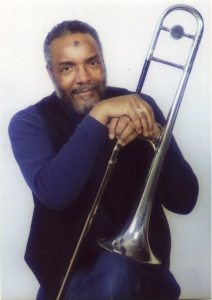 His primary trombone instructor was Charles (Chuck) Connors, who played bass Trombone with Duke Ellington, and was in the famous Dizzy Gillespie Big Band that was under the direction of Quincy Jones. He studied music theory and ensemble playing with Jaki Byard, Rollins Griffeth, Paul Neves, Roland Alexander and Ken Makanda McIntyre, and many more of the Boston based musicians too numerous to list. He performed and recorded primarily with the ‘Jazz Avante Garde’ of the Sixties and the Seventies, the likes of Ken Makanda McIntyre, Ronnie Boykins, Earl Cross, Sam Rivers, Roland Alexander, Jaki Byard, Ahmed Abdul-Malik, Bilal Abdurahman, Paul Neves, Allan Dawson, Phil Lasley, The Manifestation, Hakim jami, Phil Lasley, Art Lewis, Charles Eubanks, Chiles and Pettiford, George Avaloz, and Sam Woodyard, to name a few. However he also had the good fortune to have played in ‘House Bands’ that backed up folks like Jimmy Rushing and Billie Holiday. Mr Haroon has a Bachelor of Arts degree in music from Wesleyan University, Middletown Connecticut where he was a former Artist In Residence in African American Music, (1973-1974). He also taught music at Wesleyan and other Colleges and universities over the years. He travelled extensively doing musicological and theological research in Morocco, South Africa, Senegal, The Gambia, U.K., the Caribbean, Canada, Pakistan, Iran, Arabia, and traversed the USA from North to South and East to West. Mr. Haroon obtained a Masters Degree in History from Texas Southern University Houston, Texas with a concentration in: Techniques of Oral History and Colonial American History. He taught American History in the Houston Community College System in the 1980’s and 1990’s, including his alma mater Texas Southern. Mr Haroon was the founder of the Avicenna Library of The Islamic Education Center in Houston Texas and served as it’s Librarian for a decade during the 1990’s – during which time he instituted ‘The Islamic Education Series’ and Outreach programs that greatly impacted the prison systems nationwide. After retiring from teaching his interest in the intersections of music, social justice and religion continued as did his travels, visiting the Middle East, and Africa. He also continued to perform and participate in various ensembles which included African/African American Dance – Sufi ‘spiritual’ music. His love for writing continued, writing numerous papers and short stories concerned with music, history and religion. A collection of his lifetimes writing is being gathered as will soon be published. In 2014 he was made a fellow of the United Artists of America which took him to Africa again to pursue his studies in Ethnomusicology. Sadly in 2017 Mr Haroon was diagnosed with an incurable cancer which led to his passing on the 24th of February 2018. He passed on to the next realm in the care and company of his kind and loving family. May God bless his Soul and may he eternally rest in peace. He is survived by his wife Mujibah, his four children: Yusef, Musa, Idris and Nurah and 9 grandchildren.